As well as the general classification with its maillot rojo there are other competitions in the Vuelta a España. Compared to the Tour de France’s complex reverse engineering system for the points competition and its bizarre “beyond categorisation” climbs, the Vuelta is a lot more straightforward. Here’s a look at the systems and also the sprinters who be in the mix for the green jersey and stage wins. It’s called the clasificación por puntos but think regularidad instead. 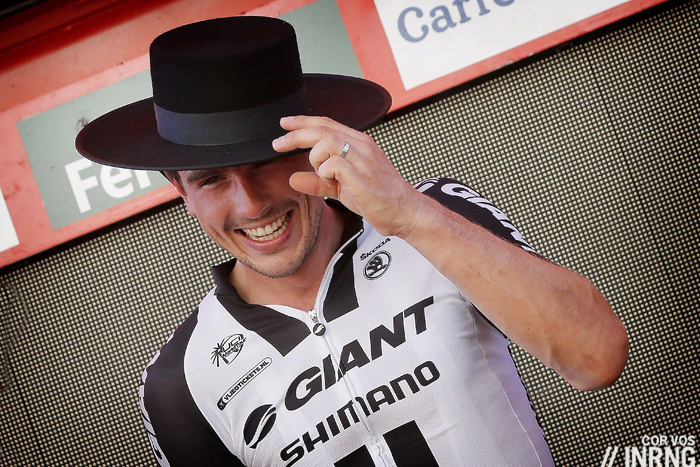 John Degenkolb took four stages last year on his way to winning the competition ahead of Alejandro Valverde and Alberto Contador with Michael Matthews the next sprinter in sixth place which shows a sprinter has to be on top of their game. This time with luck we’ll have a contest between sprinters. John Degenkolb (Giant-Alpecin) and Nacer Bouhanni (Cofidis) are the best in the field and versatile too, they can cope with a hill or two in the way. Degenkolb has thrived in this race in years past but partly because it’s been his chance to seize the team leadership, 2015 has been different for him with a successful spring classics campaign before the Tour de France meaning he’s had a lot on his plate already. By contrast Bouhanni, a double stage winner last year, is seized with conquering rage and a desire to make amends for a missed start to the year and then his Tour de France exit, he has momentum with him after recent stage wins in the Tour de l’Ain. Caleb Ewan (Orica-Greenedge), Kris Boeckmans (Lotto-Soudal) and Matteo Pelucchi (IAM Cycling) are the next level of sprinters. Ewan, just 21, is being asked to do a lot here but he does have the leg speed to win and it’ll be interesting to see what his team do with him, whether he is expected to make it to Madrid. Boeckmans is not a prolific winner but able to take a chance or two while Pelucchi had some good wins in the recent Tour of Poland, he is fast and a touch wild. Others to watch include Reunion island roadster Lorrenzo Manzin (FDJ) who is younger than Ewan; Carlos Barbero (Caja Rural) is a versatile rider, more than a sprinter, a Spanish Sagan if you like; Lampre-Merida usually have several sprinters on tap but only Max Richeze here and the Argentine rider has not won anything for years. Luka Mezgec is Giant-Alpecin’s second sprinter. Movistar bring J-J Rojas and Fran Ventoso but will be they be interested in the rough and tumble of sprint finishes when they’ve got Valverde and Quintana to protect? Kristian Sbaragli (MTN-Qhubeka) has yet to get a big win but often runs close, the same for Tom Van Asbroeck (Lotto-Jumbo) and Danny Van Poppel (Trek Factory Racing). Degenkolb and Bouhanni will need to amass points to ward off Peter Sagan doing what he does best and scoring on days when they cannot. But nobody knows what form Sagan is in, he could be in serious prep for the Worlds but last year he showed up overweight in Spain. Meanwhile the more Alejandro Valverde goes for GC the less he sprints but he’s good at sniping time bonuses and will take the accompanying points too. The scarcity of points means going on a long raid to rack up points as others have done in the Tour de France is a big ask and since rewards come on the big GC stages it’s likely to correlate closely with the overall classification. However there is always one exception, think L-L Sanchez last year, Nicolas Edet in 2013 and Simon Clarke in 2012 and David Moncoutié again and again. Picking who this might be is the hard part but let’s think of Dani Navarro (Cofidis), Esteban Chaves (Orica-Greenedge), Rodolfo Torres (Colombia), Amets Txurruka (Caja Rural) and Pierre Rolland (Europcar) as the kind of riders who could do it. 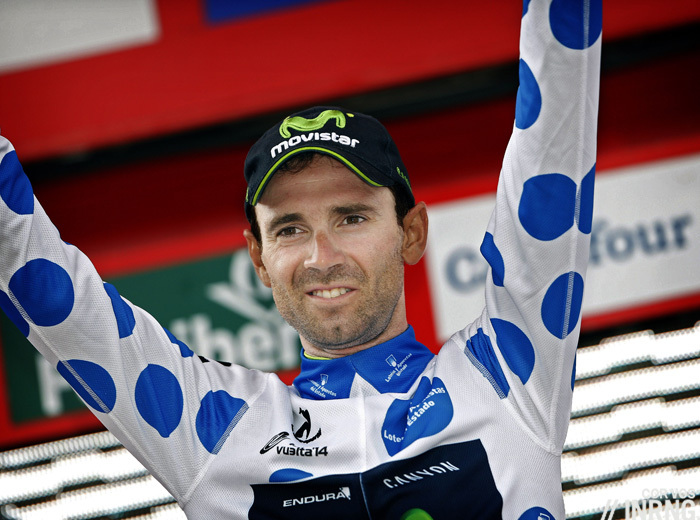 The wearer gets a polka dot jersey but with blue dots on a white background. It is sponsored by Loterías y Apuestas del Estado, the Spanish state lottery. The leader of the Combined Classification wears a white jersey. This is awarded to the rider with the best position in all three of the classifications: overall, mountains and points. It is calculated by the ranking in each classification. For example a rider who is 3rd overall, 5th on points and 8th on mountains has 16 points (3+5+8=16) and a rider 9th on GC, 4th on points and 2rd in the mountains has 15 points (9+4+2=15) and the rider with the lowest score wins. Early in the race if a rider is not ranked on all three scales then the best score across two classifications is taken. It is sponsored by Fertibera, an agricultural products company. Note there’s no best young rider competition and UCI rules limit a stage race to four jerseys to avoid confusing the public with too many in-race competitions. Each day there’s €11,000 for the stage winner, €5,500 for second place and a decreasing scale down to a modest €360 for 20th place. For the final overall classification in Madrid, first place brings €112,000, €57,000 for second place, €30,000 for third place and then down to €3,800 for 20th place. I much prefer the Vuelta points jersey scoring system than the massively complicated and messed with Tour version. Its usually a pretty close competition too between whichever sprinter has a good run (Degenkolb last year, Cav in the past) and a GC man with a decent finish such as Valverde, Purito and Moreno. Also, Greg van Avarmaet won it one year, that must mean something even if I’m not sure what, and Bauke Mollema who wins even less. I believe up until very recently the Giro points jersey followed a similar scoring system as the year Cav won it he only narrowly defeated Nibali who won the GC. It’ll be interesting to see what kind of shape Sagan arrives in. He’ll be brave if he turns up as out of shape as last year, I don’t think Oleg would be too impressed considering his salary! 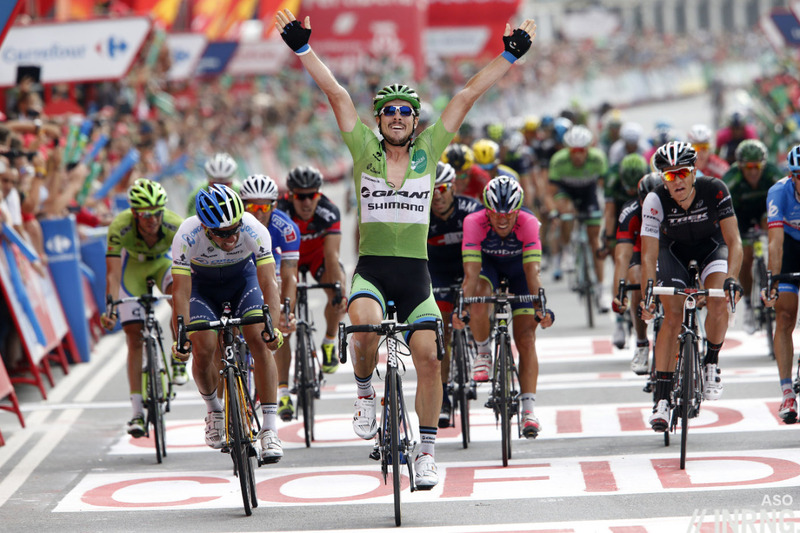 The Vueltas point system (and previously the Giro) rewards the most consistent finisher. Hence, a rider can win the competition without winning a stage. Plus, you get battles between guys like Purito and Cav for the jersey even though they don’t compete directly against each other on differing stages. I must admit that I don’t quite see the point of the combined jersey. Does it really reward a rider of distinct qualities compared to the other three? Winners of this jersey seem to be GC winners and podium finishers. I much prefer to follow a young riders competition. PS This whole TTT fiasco has me stumped. Why did nobody notice this before showing up and who would think it a good idea in the 1st place? How is a GC neutralized opening stage an adequate solution to a dangerous route? The decision on the TTT seems to be a tacit admission that there could well be fallers. So the couple of teams with nothing to gain beyond the TTT will race hard and everyone else just parades through? Pretty ridiculous scenario for a grand tour. A slip of the fingers: Fertiberia. Why is it that the wearer of the yellow and red jerseys in the tour and vuelta respectively get such a meagre amount of money compared to stage winners? 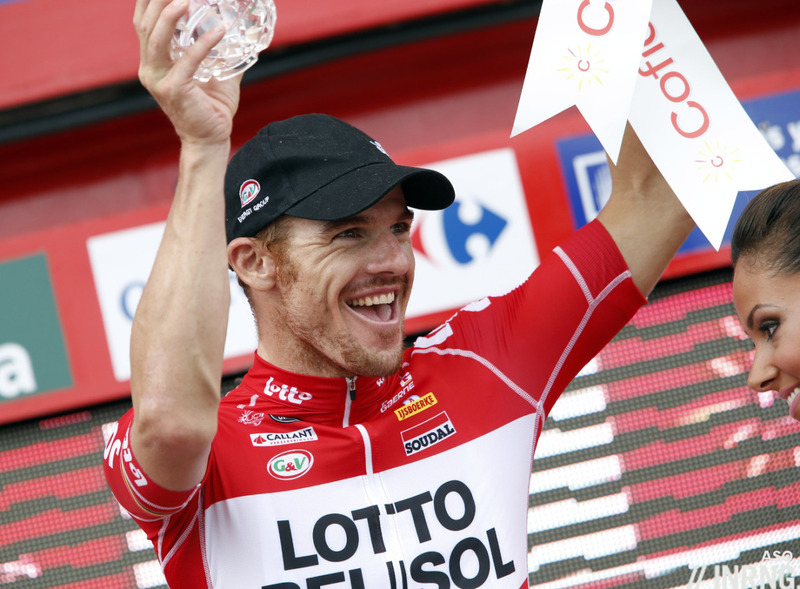 Does coming 20th on a stage really mean more than a day in the jersey? Prize money in cycling is near-irrelevant, the cash really comes from the publicity and a rider’s worth in the market. Remember prize money is taxed, levied, deducted and then shared. The sum that finally reaches the rider is a small fraction of the headline number too. speaking as a formally keen armchair fan of both the Tour and the Vuelta – I’m tired of the way the peloton rides on full speed after a crash. If a top rider is caught up through no fault of his own, this means he is out of contention – making the race far less interesting to watch. and, I think if a motorbike hits a rider the driver should be thrown off the tour, and the rider should be compensated. I also think anyone involved in causing a crash should have their bank accounts examined. paranoia? maybe. but cycling has proven to be a rather corrupt sport. 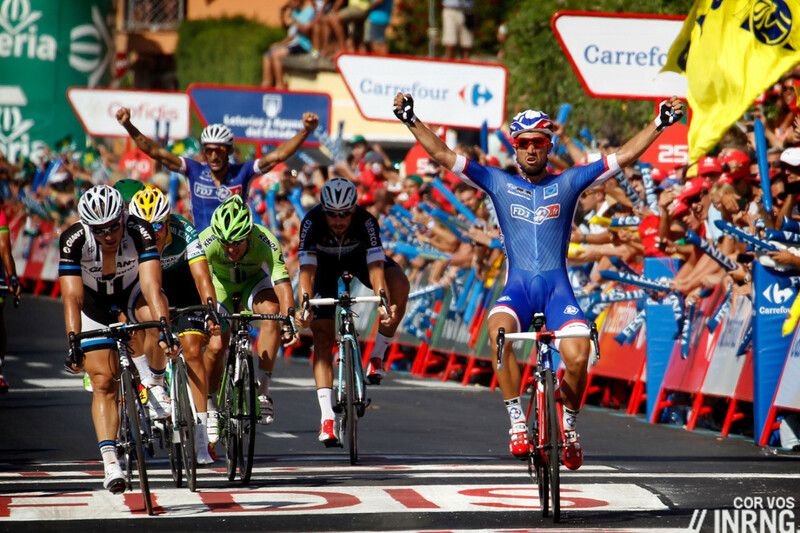 Previous post: Who Will Win The Vuelta a España?